A legal process used when a person can no longer make safe or sound decisions about his or her person and/or property or has become susceptible to fraud. Often mental illness, developmental disability, substance abuse or advanced age is identified as the basis for the lack of a person’s decisional capacity and need for guardianship.2. Is guardianship for every person with a disability? No, only those who cannot make decisions for themselves and did not make arrangements in advance of incapacity for someone else to manage their affairs. The primary test for determining the need for guardianship focuses on the person’s ability to make decisions, and to communicate the decisions once made. Does the person understand that a decision needs to be made? Does the person understand the options available? Does the person understand the potential consequences? This process involves these considerations, the adjudication of incapacity by a Circuit Court and the appointment of a guardian.3. Is the process lengthy or expensive? It is a court procedure that requires an attorney to file the appropriate documents, an examining committee’s assessment and the ruling of a Circuit Court Judge. After OPG reviews the referral and determines guardianship is appropriate the process takes approximately three months. However, there is an expedited procedure for emergencies. There is no charge when the alleged incapacitated person is indigent.4. What is a ward? An individual who has been deemed incapacitated by a Circuit Court to make important decisions about his or her own person and/or property. The court must determine the person lacks the capacity to make or communicate responsible decisions concerning personal and/or financial matters. 5. What is a guardian? A person appointed by a Circuit Court to manage the affairs of an incapacitated person, called a ward. Florida has specific laws governing guardianship proceedings and guardian activities, all of which are designed to protect the interests of the ward. A Florida guardian is accountable to the Circuit Court and must report annually on the status of the ward and account for all financial activity. Depending upon the ward’s family or financial resources, a public guardian, a private guardian or a professional guardian may be appointed. 6. What is an examining committee? Examining committees play a very important role in a court’s determination of whether a person is incapacitated and in need of a legal guardian. The committee is comprised of 3 professionals appointed by the Judge after a petition for incapacity and appointment of guardian is filed with the court. Each committee member assesses the alleged incapacitated person and reports to the Judge their recommendation, impression and opinion of capacity. 7. What is public guardianship? 8. When was public guardianship established for all of Florida? The Statewide Public Guardianship Office was created by the 1999 Florida Legislature and opened May 2000. It was determined that private guardianship is inadequate in Florida and there is an ongoing need for guardianship services. The Office of the Public Guardian, Inc., services the counties of Bay, Calhoun, Franklin, Gadsden, Gulf, Holmes, Jackson, Jefferson, Liberty, Leon, Madison, Wakulla, and Washington (2nd and 14th Judicial Circuits). Click Here For More Info. 9. Who qualifies for public guardianship services? Incapacitated persons who have limited financial resources and no family or friends willing or available to serve. 10. How does a public guardian help? i. Arranging Do Not Resuscitate, Termination of Life Support orders and burial arrangements when necessary. 11. What are the two common types of guardianship? 12. What is a limited guardianship? It is when the guardian assumes only limited, specified rights delegated by a court order. This could be a guardian of the person delegated to make medical decisions on the ward’s behalf. Or it could be a guardian of the property acting as designated payee, to make appropriate disbursements and to protect property/assets of the ward. The ward keeps all other decision-making rights not specifically outlined by the court. 13. What is plenary guardianship? It is when the guardian assumes, by a court order, all rights stated in Florida Statutes, chapter 744 that can be delegated, which may be applied to the person and to the property/estate. 14. What is guardianship of the person? 15. What is Guardianship of the Property/Estate may include anything that is the subject of ownership by the ward whether tangible or intangible? 16. 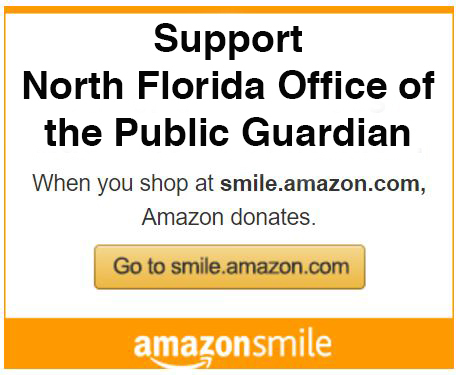 Are there other Public Guardianship programs in Florida?